Seems that the body, the mind … and the blog, are starting to ask for a short holiday, off, disconnection.. so I have to give them! It's good to stop and take things with strength and clear mind, is healthy, so soon close the oven a few weeks, I will tell. On the other hand, I'm having a July moved about personal obligations so, back, I am not able to publish all that would .. In the end, quieter times will come and, for the time being, go with a new recipe, and some more will fall before the summer break, I hope..
Today I propose a pie, as often happens, I will be richer if you take it the next day to prepare. 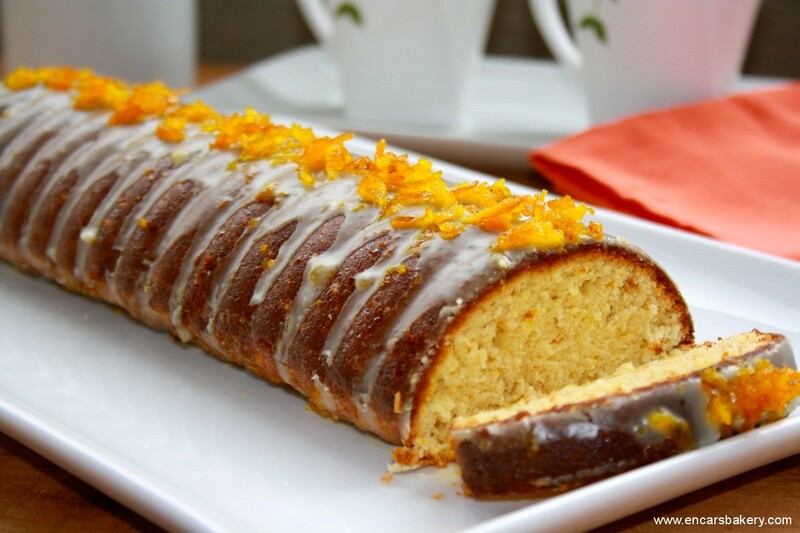 It is then that has permeated the perfection of the aroma and taste of orange, and you can enjoy a really delicious sponge cake and. I tell you and how to prepare. We started developing the batter the cake. To do this we beat the yolks with half the sugar, orange rind and grated salt, until the dough is foamy. We set clear by adding, little by little, the remaining sugar, to reach the peaks. We incorporate the egg whites to the yolk mass and mix gently. Also add to the mass of buds cake crumbs , flour, almonds and butter, removing it all from the bottom up. We spread with butter mold that we will use. I used a half cylinder of 30 cm., but if you do not have a well, You can use the plum cake of a lifetime, for example, or whatever you may have elongated, as the final form will be more beautiful. Pour the cake batter in the oven and bake, in preheated oven at 190 º C, for about 40-45 minutes. Once out of the oven, let it cool slightly before unmolding and let stand on wire rack to cool completely. Spent to develop the orange bath to get drunk on cake. 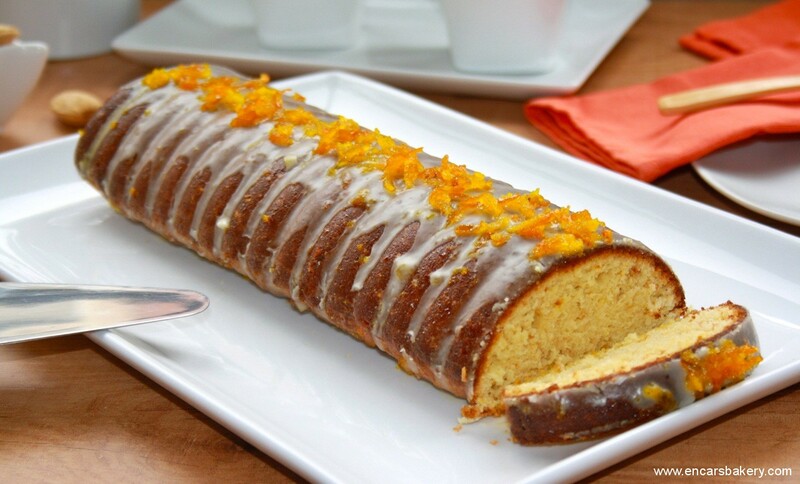 For this cast in a pan grated orange rind together with sugar and orange juice, stir and leave on medium heat until the syrup reduces to 1/3 its initial volume. Once out of the fire so let cool before adding the orange liqueur. 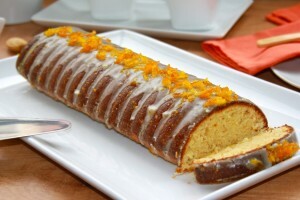 With the help of a brush we spread the entire cake with orange bath and allowed to soak well. To make the coverage started doing a glaze. To do this we take icing sugar (4-6 cdas.) in a cup and we are adding orange liqueur (o zumo de naranja), very slowly, while stir with a spoon to form a paste which will cover the cake. (The thickness of the glaze you can do it more or less depending on how you like it.. As you can see, mine is not very thick). 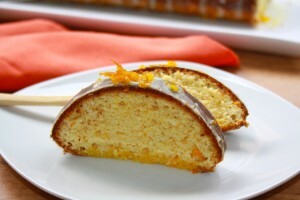 Finally we apply the glaze and, above, put the orange peel decorating to your taste. Now you see how easy it is to prepare a snack or breakfast full of flavor, juicy, with a pinch of liquor (so you could skip Tami, of course ..). I hope you liked it.. See you soon !! yumyum anything with frosting I love!! rich rich!! Please let tempting! !, I'll serve myself, but I am not content with a rebanadita, at least one pair of them,I,I. Incarnate cake terrific! And what the coolest mold! I Tembien relax but I could not help but tell you I love this cake! Besinos! It has a rich paints. A super delicious and aromatic cake. It has a fabulous pint. Hello Incarnate….I do not know why but I do not skip your posts. There's something I have bad….ainsss. Seeing this cake I remembered that I saw the mold a few days ago and said I'm going to buy….in the end, I rolled up with do not know what and I left the store without the mold….thanks for reminding. It must be the subconscious telling me not to buy more molds, I'm going to take home. I note the recipe for when I have in my possession. I forgot why take the cake dry? What effect does?. Because I have much to learn…..
Hello Sea!! and I'm glad your visit What's wrong with my blog entries I too about some other, I think we have something misconfigured, I do not know.. As not know much about computer, what I do is follow this blog otherwise, via RSS or social networks. In story to your question, bearing in mind that you do not speak any expert with extensive experience in the field.. :), I think it's because it takes very little batter and not too much almond flour, so to give “body” we need some more solid ingredient (fluids and thus compensate) and, in this case, Dry cake crumbs (I put sponge fingers) is like a meal in the mixture, and their composition is carried. I understand that this is why..
A kiss and greetings to your husband! We are all looking forward and take holidays. Nieves last year and I still published in August things we had prepared earlier, and may do the same this year, because we still have much unpublished, but you really have to think off and enjoy. How curious it to dry cake crumbs, I had never heard! Of course the look is excellent! Encar, beautiful, as you prepare everything that God has been. The color of the crumb is fabulous and the orange glaze…ummm, it makes my mouth water. Since adelantarás us more of your vacation but, not missing you too that you will be sorely missed…I already forgot, that mine head, thousand thanks for your kind words at the entrance of the first anniversary of my blog. You're a wonderful friend. Thousands of BASIC. How beautiful the mold, and the orange glaze has a delicious pint. 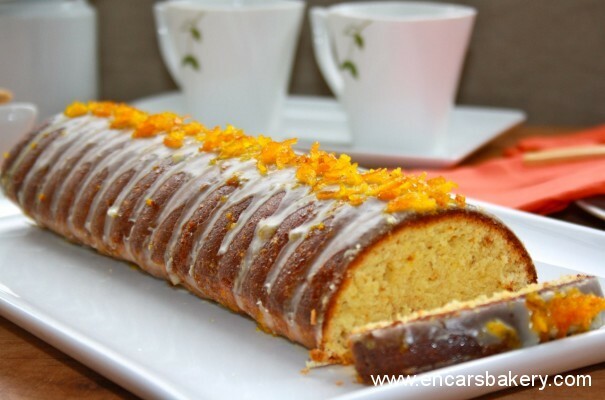 A delicious cake, Encar. I assure you that in my home I can hardly wait to try it the next day, although they say it's much richer. The glaze gives it a delicious. I do keep this recipe, and as a mold alrgado nice find, the taste. A kiss.